For the first official day of celebration we are taking a look at the movie riders of Kamen Rider Gaim! These are the Riders that appeared only in movies (and maybe showed up in an episode to tie in to the movies). Over the course of three movies there have been some exclusive riders (most notably the Kamen Rider Gaim Summer Movie). And while a majority of us wait for a release of the summer movie on DVD, the other two movies are available and we’ve experienced them. Please click “Read More” to take a look at the movie riders – namely Bujin Gaim, Kamen Rider Fifteen, Kamen Rider Kurokage Shin, Kamen Rider Kamuro, and Kamen Rider Mars (with a brief extension to Kamen Rider Jam). Join us because for nine days the stage is ours! Henshin! Note – if you haven’t seen these movies, there are spoilers in our “Read More” section! If you haven’t seen the movies, or read up on the movies, then you probably don’t want to click “Read More”. But you know you want to. It’s a celebration after all! As you know by now, this weeks regular Super Hero Time programming is being replaced by a very special crossover. This hour long special is Kamen Rider Gaim VS Ressha Sentai ToQger! Serving as a prelude to the Heisei VS Showa Featuring Super Sentai film, this special will mark only the second time ever that a currently running Rider & Sentai will share a storyline. 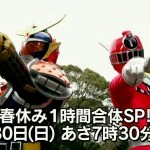 The first being Kamen Rider Decade & Samurai Sentai Shinkenger. This special is labelled as Episode SP for both series and chronologically should take place between Gaim episodes 26 & 27 and ToQger 6 & 7. The episode itself airs shortly in Japan and subs will of course be up later in the week from our favorite groups. For now click “Discuss on the TokuNation Forums” at the bottom of this post to be taken to our stickied discussion thread/poll for this special in the News and Rumors section. DX Lock Seed & Faceplate Set for Movie-Exclusive Kamen Rider Fifteen Announced! One more special combo for Kamen Rider Gaim Riders! This latest Premium set features the DX Lock Seed & Sengoku Driver Faceplate belonging to Kamen Rider Fifteen, the new Movie-exclusive character in the upcoming “Hesei VS Showa Featuring Super Sentai” Kamen Rider Movie War. The Fifteen set will cost a mere 2000 Yen and be available in August 2014! Kamen Rider Gaim Jinba Cherry and Rider 1 Arms Revealed! 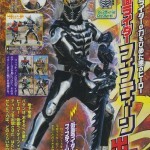 Not to be outdone with just his Kachidoki Arms reveal today, Gaim will also receive two other upcoming forms. Kamen Rider Gaim Jinba Cherry Arms is just like the previously seen Jinba Lemon & Peach. Jinba arms is symmetrical on all sides and rotates around the riders head based on the energy lock seed used. Then corresponding flaps fold down to reveal that locks attributes. Jinba Melon can’t be far behind! And we have one more arms confirmed for the Hesei Vs. Show Kamen Rider Taisen film! We already knew that Kamen Rider Fifteen would have a few arms of his own, but now we can confirm the existence of Gaim’s very own Rider 1 (Ichigo) Arms! 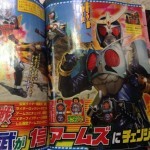 The movie is set to introduce two new lock seeds, the Hesei Rider (Gaim) Lock & the Showa Rider (Ichigo) lock. Fifteen will use the Hesei lock to access Gaim Arms (not to be confused with Orange Arms) and Gaim will use the Show lock to access Rider 1 Arms!